Animal Wildlife | Hercules Beetle | The Hercules beetle is one of the largest species of beetle in the world, and is natively found in the jungles of South America. The Hercules beetle is the largest and most well known of all of the rhinoceros beetles, a group of large beetles that are closely related to the famous scarab beetle. The Hercules beetle is found throughout the tropical jungles and rainforests of Central and South America, where the Hercules beetle spends the majority of it's time foraging through the leaf-litter on the forest floor in search of something to eat. The fallen debris also helps to hide this enormous insect as it moves about. There are thirteen known species of Hercules beetle found in the jungles of South America and the Hercules beetle was named for it's sheer size as some males have been known to reach nearly 7 inches in length. Although it is quite rare for these beetles to get quite so big, the average adult Hercules beetle is usually between four and fifteen centimetres long depending on the species. The most distinctive feature of the Hercules beetle has to be the enormous horn-like pincers which protrude from the forehead of the males. 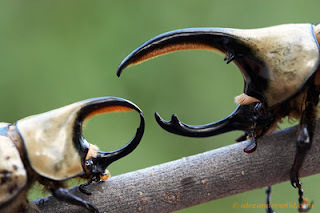 These horns can grow longer than the Hercules beetle's body and are mainly used for solving disputes with other male Hercules beetles. Female Hercules beetles do not have horns but their bodies are thought to be larger, but shorter than their male counterparts. The Hercules beetle is an omnivorous animal but it;'s diet both in it's larvae and adult stages, is primarily made up of decaying plant matter. Rotting wood is the favoured meal of the Hercules beetle, along with fruits and other plant matter and the occasional small insect. 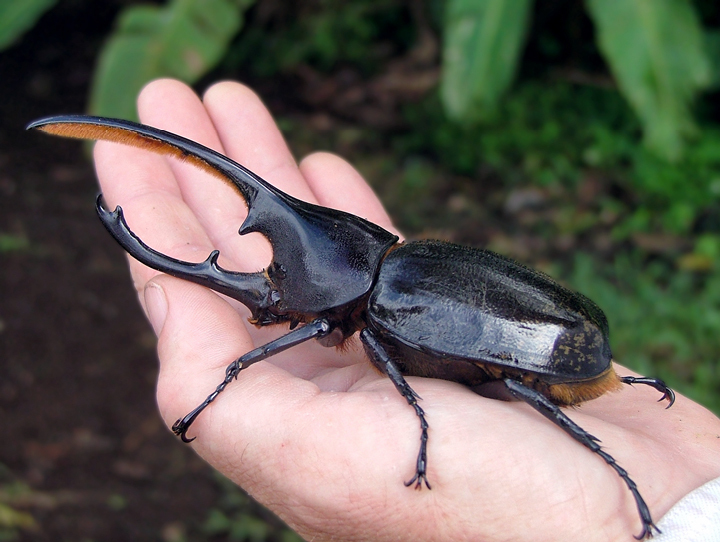 The Hercules beetle is said to be the strongest creature on earth for its size, able to carry 850 times its own body weight but these enormous insects are still hunted by numerous animals throughout the jungles of Central and South America. 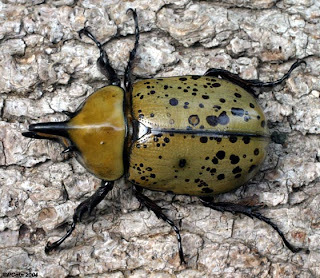 Bats, rats and birds are the main predators of the Hercules beetle along with reptiles and omnivorous mammals. The larval stage of the Hercules beetle will last one to two years, with the larva growing up to 4.5 inches in length and weighing up to 120 grams. Much of the life of the Hercules beetle larva is spent tunnelling through it's primary food source of rotting wood. 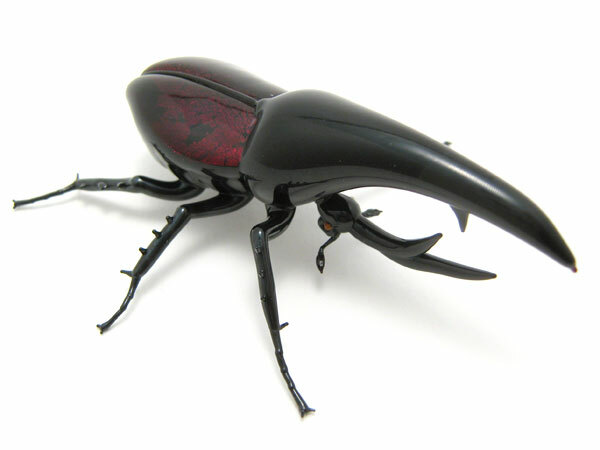 After the larval period, transformation into a pupa, and moulting occur, with the Hercules beetle then emerging as an adult. Today, the Hercules beetle is threatened as much of it's natural habitat has been lost to deforestation or been affected by both air and water pollution. 0 Response to "Hercules Beetle"